Rhesus monkeys roamed around the cubical in the lobby of the center in this Globe file photo. Harvard’s primate ­research center, which has been investigated for animal welfare violations in the deaths of four monkeys, will be largely shut down by 2015, Harvard Medical School said Tuesday. The university cited a tough economic climate for research funding and a shift in long-term strategies. The announcement stunned people inside and outside the institution. 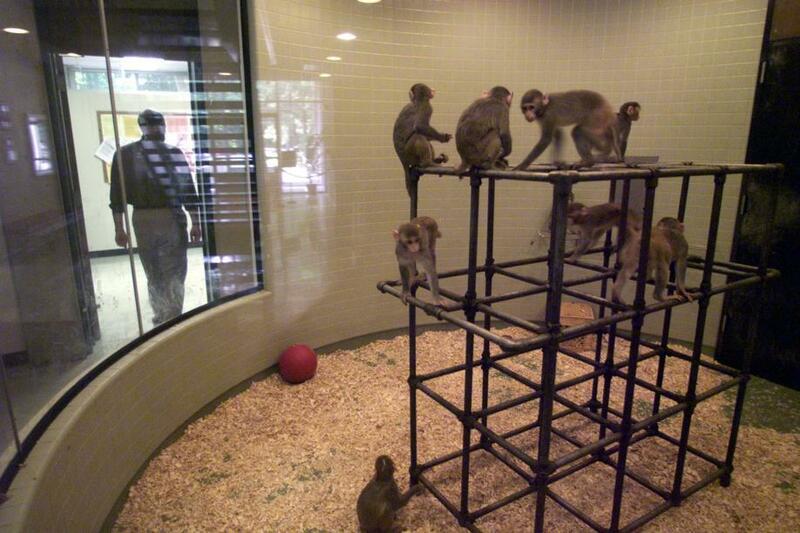 ­Harvard had invested significant resources in the New England Primate Research Center in Southborough to correct care and oversight problems that resulted in the monkey deaths between June 2010 and February 2012. US Department of Agriculture inspectors found numerous violations of animal welfare rules after the deaths, an embarrassment that caused consternation across the university. But medical school leaders said the decision to close the 51-year-old facility, where about 200 people work, was unrelated to its problems. Harvard Medical School administrators and government officials said they will find ways for scientists with active federal grants to continue their work. But the pace of research is likely to be slowed by the need to strike up new collaborations, look for jobs, or spend time setting up laboratories. David Knipe, a professor of microbiology and molecular genetics at Harvard Medical School who has used monkeys in his AIDS vaccine research, said the center had built a strong team of ­researchers with expertise on a nonhuman primate version of the virus that causes AIDS. Knipesaid some scientists have already left. The decision was ­announced to a packed room at the Southborough facility. Kim Van Savage, who works in human resources at the center, said there was a wide range of emotions, including tears. Medical school leaders said they were working on a transition plan to help the 20 faculty, 32 postdoctoral researchers and graduate students, and 150 staff members find new positions while continuing their jobs to support the animals and research as the center moves to close over the next year or two. They will also need to relocate close to 2,000 monkeys, perhaps to some of the seven other national primate ­research centers. None of the animals will be euthanized, medical school officials said. It is uncertain how many jobs will be found for staff members and where the animals will end up, given that many research centers and universities face the same economic pressures that led Harvard to make its decision. Administrators said in an interview Monday that the school’s leadership decided not to reapply for a five-year federal grant that provides the base funding, a decision made in consultation with Drew Faust, Harvard’s president. “The decision that we made was a strategic long-term decision and not based in any way on the problems we had,” said Jeffrey Flier, dean of the medical school dean. “The school would have had to make considerable investments,” he said. “Those are investments that would not have been able to go in other directions. And when we looked at everything, including the more difficult external funding environment that we all face,” this was the right decision. This year, the primate center projects it will receive $27 million in US funding, but universities are bracing for reductions in federal support because of recently enacted spending cuts. The medical school estimates that over the next five years, the primate center would demand an ­investment of $20 million to $25 million from the school. A Harvard Medical School animal facility with 42 primates in the Longwood Medical Area will continue to operate. Jay Kaplan, director of the center for comparative medicine research at the Wake ­Forest School of Medicine and one of the job candidates during the primate center’s search for a director last year, said the expenses of running the facility are significant, includ­ing utility bills and the cost of updating primate housing. He noted that the distance between the facility and the main medical campus in ­Boston kept the two entities from being as closely knit as they could have been. James Anderson — a deputy director at the National Institutes of Health, which provides the major funding for the primate center — said Harvard notified the agency of its plans about a week ago. Animal rights activists hailed the closure. Deborah Kochevar, dean of the Cummings School of ­Veterinary Medicine at Tufts University, was surprised. She said Harvard seemed committed to fixing the problems and to the ­future when she and a team of specialists reported on its operations last summer. Carolyn Y. Johnson can be reached at cjohnson@­globe.com. Follow her on ­Twitter @carolynyjohnson.